U.S. home inventory tumbled to a new record low in the first quarter of 2017, with inventory down 7.1% from this time last year. Homebuyers have now been stifled by low inventory for the last two years despite prices rising in many markets. This isn’t a surprise as the real estate news has been the same for months, not enough homes on the market and those that are, sell fast. However, if you dig into the numbers a little deeper, you’ll find that yes, inventories are historically low but only for starter and trade-up homes. Home type segmentation is important because home buyers need information not just about total inventory, but also about inventory in their price range. Homes are generally bucketed into three groups by price range: starter, trade-up, and premium. A starter home is the first home that a person or family can afford to purchase, usually one or two bedrooms and often a bit of a “fixer upper.” From last year, the number of starter homes on the market dropped by 8.7% and homebuyers today will need to shell out 2.9% more towards a home purchase. First-time home buyers need to be prepared to act fact and use a little creativity and flexibility to find the right home. Trade-up homes are when homeowners buy using the equity that is built in their current home to help finance a more expensive one. From last year, the number of trade-up homes on the market decreased by 7.9% and homebuyers today will need to pay 1.6% more towards a home purchase. Buyers looking to trade-up their starter home, need to plan for a quick sale and to be ready to move fast a new home. 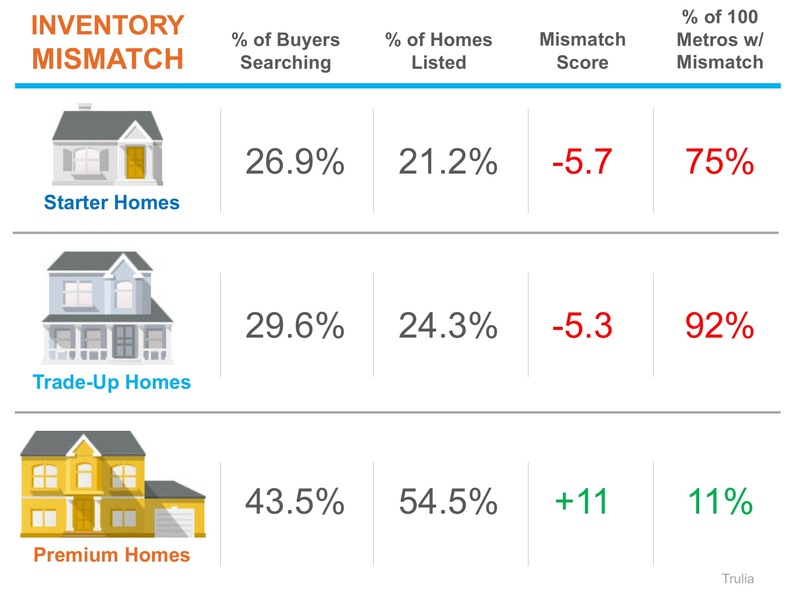 Nationally, buyers are searching for starter and trade-up homes and are coming up short with the listings available, leading to a highly competitive seller’s market in these segmentations. Ninety-two of the top 100 metros have a shortage in inventory. Premium homebuyers have the best chance and a surplus of listings in their price range, leading to more of a buyer’s market. The number of premium homes on the market decreased by only 1.7% and homebuyers today will need to spend 0.6% more of their income for a home than last year. If you’re looking for a premium home, you have lots of choices, however if you’re selling a premium home keep in mind it may take a while. The key to finding your next home in today’s market is being prepared and educating yourself on the current real estate market. If you’ve been kicking around the idea of buying or selling, it’s never too early to start the process. Contact The Garatoni Group and we’ll get you prepared for a smooth real estate transaction. Next, check out A Tale of Two Markets: Part 2, where we discuss rising prices for starter and trade-up homes. Previous Should You Co-Buy A Home?